Metal flashing on post (for a box that is being relocated) showing assembly. Photo by Peak. Buy aluminum flashing at a hardware store. The widest you will probably find is 20 inches. It comes in several lengths - get the longest - 50 feet. It costs about $35. Cut it into 16" pieces, so it will wrap around a 4x4" wooden post (which is actually 3.5x3.5") with a slight overlap. WARNING! The edges of the cut metal are VERY sharp. Be sure the cutter is wearing gloves. Gloves are also recommended when wrapping the metal around a wooden post. Then place the next sheet above the first, making sure there is about 1 inch overlap, and attach it the same way. If you have an 8 foot post buried 1.5 feet in the ground, it will take about 3 sheets of flashing to cover the post beneath the nestbox (slightly less than 60 inches for total coverage). A very hungry and very persistent raccoon can hug the post and climb up, but most give up and look for an easier meal. You may see muddy paw prints on the aluminum flashing indicating how far the raccoon climbed. Since the Peaks covered all of the posts at a trail in a park, they doubled their annual fledging rate at that location. 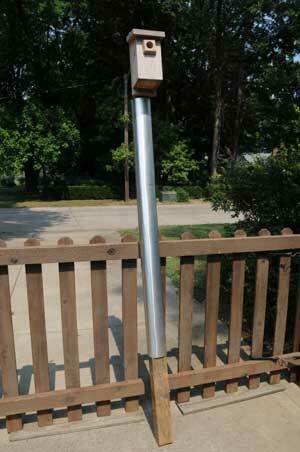 If a nest box (with a covered post) is raided more than once, Peak puts a taller post (10 feet) in that spot. That height requires a ladder (e.g., 4 foot aluminum) to monitor the box, but it’s worth it to give the birds a fair chance. There has been no predation in those boxes. Although the flashing is not as aesthetically pleasing as the plain wooden post, sometimes practicality and protection of cavity nesters must prevail. Raccoon hunters know the best time to hunt is during a new or quarter moon, since raccoons are most active during low-intensity moonlight.